Superior flexibility makes these extra-long hoses easy to coil, uncoil and maneuver around obstacles—ideal for use with our Shop Vacuum Hose Reel. 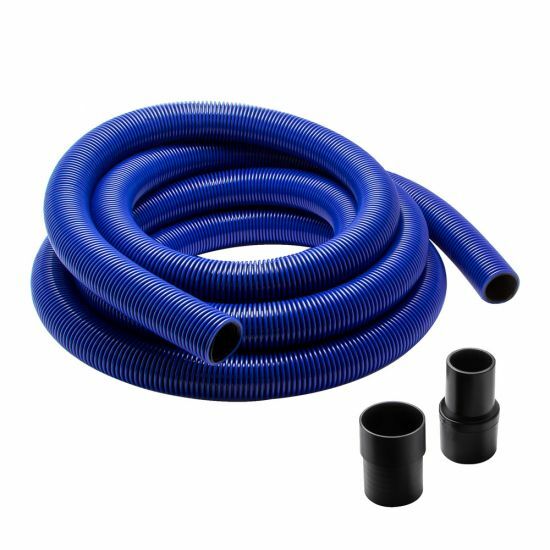 These premium-quality hoses are available in 20' and 40' lengths for users who prefer to leave their shop vacuum in one central location, and pull out just the hose for cleanup. They're ideal for use with our Shop Vacuum Hose Reel (#52542, sold separately). Unlike typical shop vacuum hoses, ours feature a helix design with no memory, so they uncoil beautifully every time. They won't kink or crush, and you won't have to fight to get around corners and obstacles. 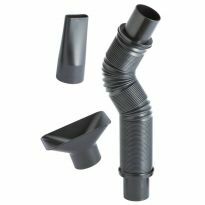 The hoses are built from a durable yet supple polymer, and include swiveling ports that help prevent twisting and tangling. 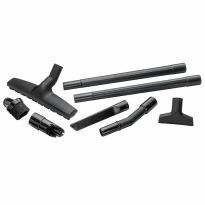 For a selection of compatible cleaning tools, see our optional Accessory Kit (#52125, sold separately). I have 2-20 foot hoses and they are very easy to work with but still hold up to being dragged across the floor. 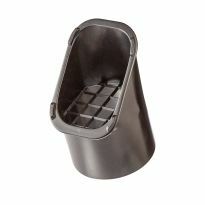 Excellent product for my small shop dust collection w/dustrite seperator. Very good upgrade from 1.5 inch vac hose. Much more air flow! Heavy duty. Perfect for contractor table saw. Would recommend to others. Great hose for the money! Great hose for the money, it's a match for the roller. Good quality. Flexible and easy to use. This is my second purchase of this hose from Rockler. In my opinion, it is so much nicer that the hose that came with my ShopVac. 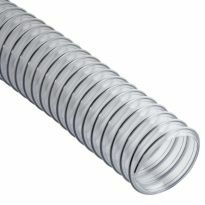 This hose is much more flexible than the standard hose, and therefore is easier to coil up for storage, or drag across the shop floor, etc. It may be crush proof, as I have stomped on mine a couple times, and it still works just fine. My old hose has been dedicated to my tablesaw overarm dust collector, and this new hose will be dedicated to my miter saw and CNC router. Highly recommended! I really like this hose it wraps well doesn't get kinked and seem very durable. The only thing I don't like is that both connectors are different. One end fits your standard shop vac (2 1/2 OD, 2 1/4 ID) and it fits the Dust Right separator but the other end is smaller. Possibly made to fit other vacuum accessories. I purchased this hose to fit my current Sears/Craftsman shop vac, but I had to purchase an adapter to connect the hose to my vac. I would have liked both connectors the same - both connectors capable of fitting a standard shop vac. This is the second hose I've purchased but it's much more ridged than the previous one. This makes it less flexible and harder to use. Overall good quality. Great Hose for my needs. I have the Universal Small Port Hose Kit and the fittings screw into this hose perfectly. No coil memory and the hose seems sturdy. I assume it'll last a long time. I have a ShopVac to which one end of hose could attach but the other end required a connector to fit the vacuum wand. Fortunately I had previously bought a Universal Small Port Hose Kit (by Dust RIGHT) and could use these to connect to the smaller vacuum attachments. The 40' hose length is very convenient for cleating the garage and cars. The hose worked as specified, but although 20n ft sounds long after putting it on my hose reel it was too short to reach around objects. I recommend the 40ft version if it is being purchased for the wall mounted hose reel. Quality hose. Good fittings. Well made & rugged enough it seems to stand up to the inevitablilty of me stepping on it. Wraps up neatly s well especially when reeled up on the tickler hose reel (a true 5-star product) . Only reason it's not a 5-star it's not anti static and the ridges do catch on non rounded corners. Hose is flexible and works well. My problem is that 1 end connects well to the exhaust system, but the other end is for vacuum cleaner attachments. Not in the product description. I've had to jury rig and tape heavily to use the hose. Bought this to connect my miter saw(s) to the dust collection system and it is perfect for that. But, that only used 5' of it. I'd like to use the rest for connecting my other miter saw but, apparently extra fittings are available. I'll have to shell-out for another complete hose kit and then have a LOT of leftover hose. Maybe someday. End fittings were not compatible with my equipment. Otherwise works just fine. Lack of a key accessory limits usefulness! 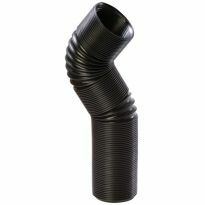 Most shop vac hoses have a 2-1/4" OD connection at each end. That's not how this is set up, and it turns out that Rockler doesn't sell the port separately to make the hose match a regular shop vac hose. I talked with Customer Service, and they have "asked the manufacturer" to sell it separately, but that doesn't help if you have an immediate need. Nearly every piece of home shop equipment is set up to receive a 2-1/4" shop vac hose (including, for example, Rockler's own router table fences). The inability to use this hose on that equipment is a real drag. EXTREMELY POOR PLANNING on Rockler's part! The assembly was a bit of a problem but, eventually I got it up and running. Almost immediately the bolts the handle to the drum loosened. After re-tightening many times and adding lock washers to keep it from loosening the bolt holding the handle on ultimately broke leaving me with no handle to turn the drum. In addition very few vacuums, unless they are in industrial strength, can apply enough suction with 40 feet of hose. I'm probably going to take it off the wall and curl the hose in the corner. Too Long or too short with no way to connect. As others have commented, the 40' length eats up a lot of the suction. 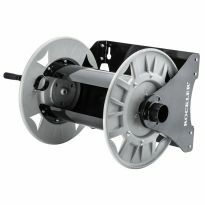 What I would like to do is use a 20' length for my hose reel to maximize suction for messes near my hose reel and have another 20' that I can connect to it so I can clean up far away messes but Rockler does not sell a hose connector. 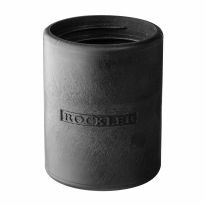 Big problem that would be easy for Rockler fix by designing and creating a prototype and even a mold with a 3d printer. Will give this one a try to stretch across my shop. Saw it on DIY Tyler's youtube channel. Needed a new vacuum hose. Could not find this size hose to extend the range of my Karcher shop vac. Any one who uses a shop vac knows that it does not roll around on the wheels very well and always is getting stuck on corners and cords. The hose is long enough to reach anywhere in my shop. It is also tough and yet flexible. Looks like a good product and sale price was attractive. The hose I purchased originally was a bit short. Wanted more reach. Length believe will fit my Sears shopvac. Husband wanted this for his workshop as a birthday gift. Needed a longer hose to go with my Dust Right Universal Small Port Hose Kit (USPHK). Uncertain if I can couple the two hoses. A Rockler Rep said the attachments (ports) from the USPHK don't fit snug into this hose. For dust collection from small power tools and length. For better control of the hose. These are good solid hoses. I needed this one to extend my reach into the corners of the shop. replace existing hose on shop vac. Ease the use of my shop vacuum without moving it constantly. In order to collect dust from a number of tools without having to move the shop vac. I need a longer more flexible hose for my shop vac other than the one that came with it. For attaching to band saw and other small tools. I am getting a Dust Filter and do not want to haul the vacuum and dust filter around. With this hose I will be able to locate the vac and filter out of the way and take the hose to the tool. Eventually I may purchase the hose reel, however, it is a bit pricy so I will try this first. How can I order extra Port #1 and Port #2 connectors without having to purchase another entire hose and connector kit? Will this connect to a DeWalt DWS780 Miter Saw? 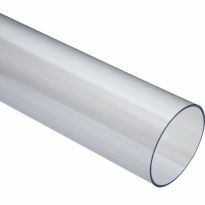 The dust tube measures 1 5/8" on the outside. BEST ANSWER: No, it will not fit directly. After purchasing many adapters, the only thing I have found to fit the DWS780 is the Rockler Universal Small Port Hose Kit. Is this hose anti static? What is the actual OD of this hose? BEST ANSWER: The actual hose's OD is 1.89" There are two different sized fittings on the ends however. Is there significant suction loss over 40' of flexible hose? 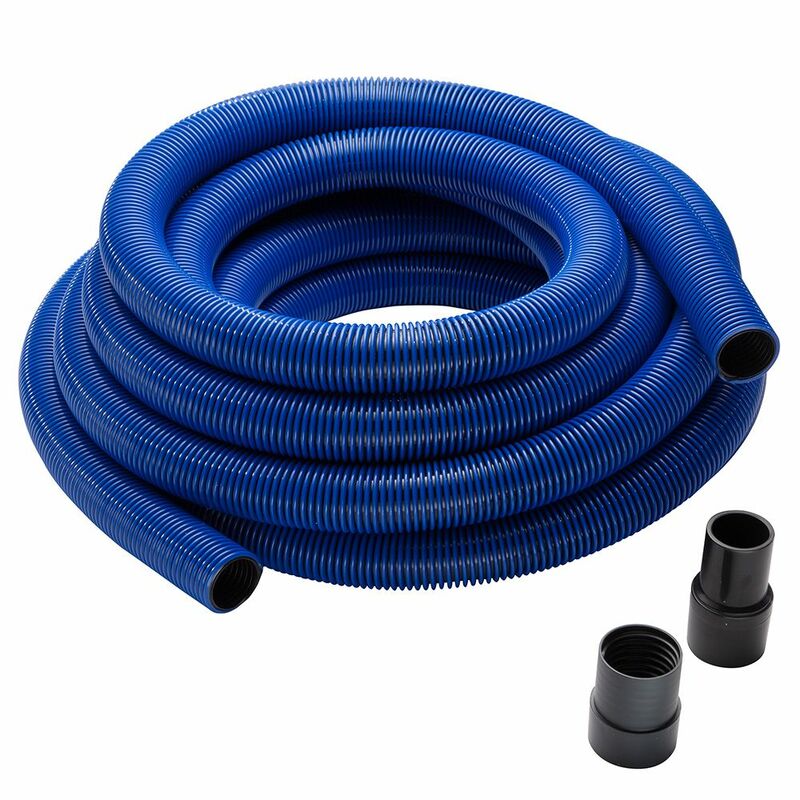 I am interested in the 40' hose (Item #: 50669) to use in the Dust Right® Shop Vacuum Hose Reel (Item #: 52542) but I'm worried that my shop vac will lose too much suction over that length of flexible hose. BEST ANSWER: I have an old Fein Turbo II vacuum with an attached Dust Deputy. I purchase 20' of the Rockler 2" hose and then added the 16' of the Fein hose which I believe is about 1-1/2 ". There is a little loss in suction but it still picks up dust and 1/2 dia. chunks of wood through the floor attachment. I suspect the people that say they have too much suction loss do not have a high quality vacuum. I have noticed quite a bit of loss. I'm not sure if it's the 40' length vs. the fact that my shop vac is a 2.5" port that gets reduced to 1.5" hose. I have a 20' hose as well, and dont see much difference between the 20' and 40' hose loss (both have very noticeable loss). Using these hoses, i can pick up saw dust, but nothing bigger than that. My vac is a Shop Vac 6.5hp model - so it is very powerful. I also use a dust deputy, so the vac filter stays clean and doesn't contribute to loss. Thanks for this information. This is a large investment for something that seems like a great concept, but needs to be well planned out to be an effective solution. Don't have the dust collection system hooked up yet? I've attached the hose and reel to my 1 1/2 dust collection system versus my dust vac system and there's plenty is suction. Not sure how much loss I'd have with Shop Vac system. Do you mean a 1 1/2 hp dust collection system? I do have that already and could certainly hook that up to this but I thought the higher suction pressure of a shop vac would overcome the friction loss of the ribbed hose better than the dust collector when reduced from 4" to 1.5"
Yes, I have both and use a gate to move back and forth. There's sufficient suction with both. Is this hose heavy? I want to use it to connect my dust collector to my RO sander. Anyone use this hose for a vac-tool application? BEST ANSWER: IT is definitely heavy-duty. A little stiff for tight radius as you would expect. Otherwise it is good product. The hose isn't that heavy, the reel and the hose is pretty heavy however. am thinking about this. would connect to 5 horse collector. you think i would be able to pull through the 40" of hose? BEST ANSWER: We use the 20 ft. version with various attachments connected through a Rockler hose reel then through Rockler dust separator before going into Ridgid 6.5 hp vacuum. Even with all those restrictions it vacuums well although not super strong. So far none of that has gotten clogged up although that is one of my concerns since some folks think they can vacuum everything large and small. I think it would be a pain to clear a clog from a 40 ft. hose..... as it would be from 20 ft. I wouldn't use it as a primary dust collector at a sander or saw, etc. but seems fine for floor and bench sweeping. Good luck! The problem with using a 40' hose is friction. I have purchased this hose plus the reel and hooked it up through a saw dust collector reservoir to a 6 hp shop vacuum. Things I noticed is that with all of this footage and volume you need to give your system a few minutes to induce a vacuum in the hose each time you turn it on. If you are going to hook the hose directly to you vacuum you should do better, but you should check the connectors with your vacuum to make sure they are interchangeable. There are no industry standards for all the components on the market to ensure you can have an air tight system. Is this hosed corrugated inside ... or smooth? BEST ANSWER: It is not 'as' corrugated inside, but there are little ridges. It is not smooth. Yes the inside is ribbed or corrugated. Will the hose ports fit a Ridgid 6 hp, 14 gal. shop vac? BEST ANSWER: Yes, there are two different sized ends. One of them will fit the 2.5 vacuum port on the ridged shop vac. Are there hose adaptors to fit to a Festool CT dust extractor? BEST ANSWER: Not 100% sure, however you should be able to adapt it to anything. I adapted it to fit my 7 hp cyclone dust collector. Does this hose & fittings allow a connection to a 1&3/8 OD outlet? will this hose screw onto the Dewalt Dust Collector hose attachments? The Dewalt hose marks up everything it touches, but I still want to use the ends. What is the outside diameter of the hose?